How hard is it to build a custom home? How involved do you want to be, when it comes to all the details in your new home? 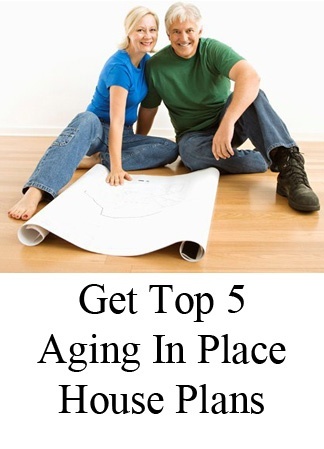 Got a good idea of what you want in your new home? Ask how much time you can spend looking around at extensive showrooms, choosing every faucet, type of stone and slab of granite - with the level of input you'd prefer from a design expert. 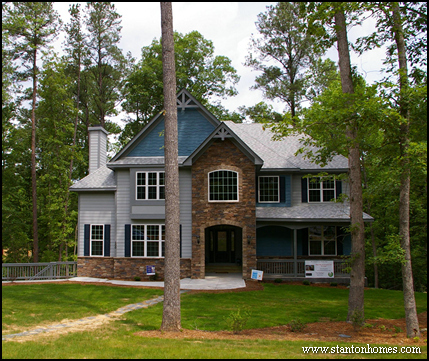 The Penelope is an example of a custom home Stanton Homes designed and built with an NC family who had a huge hand in everything from concept to amenities. They wanted to make all their own choices - and appreciated the enormous array of flexibility and nearly endless selections that accomodated the level of involvement they wanted to have. 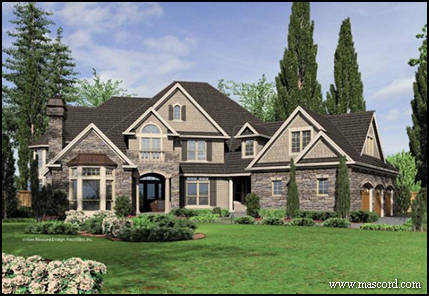 Have no idea how to make everything come together for your new custom home? The Bryson is a home plan designed and built by the Stanton Homes design team for a couple who didn't want to have to spend a lot of time making choices. They simply said "create something special for us" and sat back and watched it all come together. 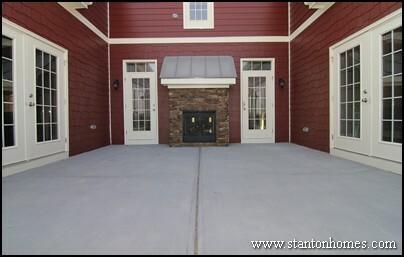 Stanton Homes based their fully custom floor plan on the couple's lifestyles and made interior and exterior design selections for them, based on things that got them excited. Having the level of control that you need to create your new home is one of the best reasons to build a custom home. 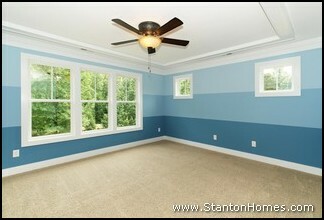 Our ability to offer you that kind of choice is another one of the top ten reasons homebuyers trust Stanton Homes. Get started here, and tell us what you’d like to create together. 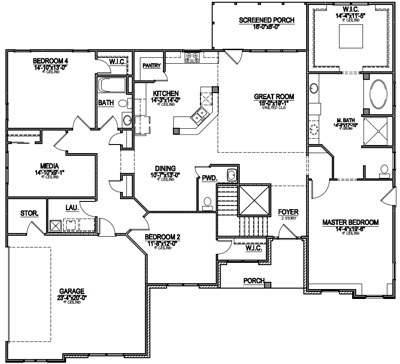 The hottest floor plans in 2014 reflect today's more interactive lifestyles. 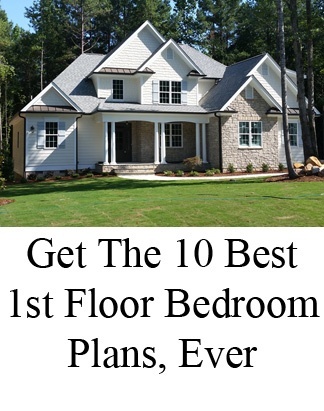 Take a look at our 10 most popular floor plans for NC new homes and see all the ways these designs open up opportunities to mingle and relax. Why this plan is popular: The Dugan, a Stanton Homes original design/build is a fully wheelchair accessible home complete with an elevator and second story mother in law suite. But it's beautiful curb appeal, with varied levels and contrasting features has also inspired fresh versions that are more traditional. The first floor is an open concept design with a large island kitchen, island master suite closet, vaulted great room, and outdoor living. The second floor can be a totally separate apartment or a myriad of different layouts. Why this plan is popular: The Hallsville, an Alan Mascord floor plan, is European country home designed to feel like a casual estate. 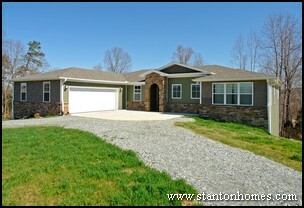 This home offers two master suites - one on the main level and one on the upper level. The second floor master features a bay sitting room, walk-in shower, and dressing closet with a built-in two-sided dresser. The first floor master is designed as a guest suite. This home offers three dining areas: a sun-filled breakfast nook, a formal dining room, and a circle-shape snack bar island. The outdoor patio features a built-in outdoor kitchen and barbecue area. Storage spaces are built in every direction, with a large mudroom with storage cubbies, closets, and a clean-up sink. The basement level features a wine cellar. Why this plan is popular: The Greenhaven, a custom design/build home by Stanton Homes, offers over 3500 sq ft of comfortable living space. The mother in law suite has a private first floor entrance with optional ramp. On the second floor, the master bedroom features a sitting room, his and hers style bathroom, and oversized walk in closet. An office, located on the third floor, is tailored to the needs of a work-at-home professional with built-in bookcases and designated desk space. Additional third floor space is available if desired. Why this plan is popular: The Pasadena, an Alan Mascord floor plan, combines traditional beauty with simplicity of design. 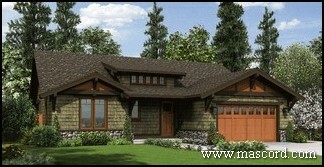 This craftsman home design emphasizes artistic components of the 19th century England Arts and Crafts movement - such as the use of natural materials - throughout. 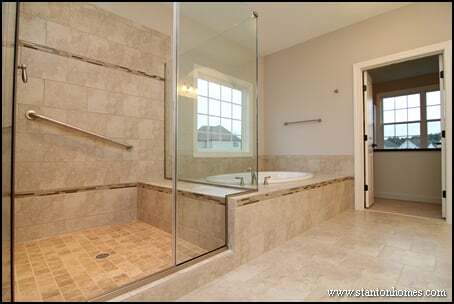 Why this plan is popular: This home, a custom design/build by Stanton Homes, was created to specific accessible needs: first floor living, zero threshold shower, wider hallways, universal design kitchen, easy access driveway. The Paige is functional and beautiful, with arched openings, built-ins, and custom touches throughout, and can be built as a traditional home as well as accessible. 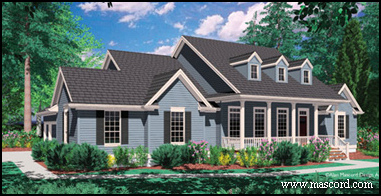 Why this plan is popular: This floor plan design by Alan Mascord is extremely welcoming, with a classic country style covered front porch that is designed for outdoor living. 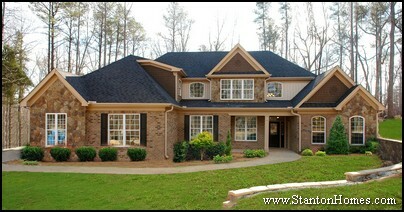 Built-in niche, bookcase, media center, desk, and butler's pantry punctuate this home with efficiency. The foyer, dining room, kitchen, nook and great room all emphasize open, comfrotable living. 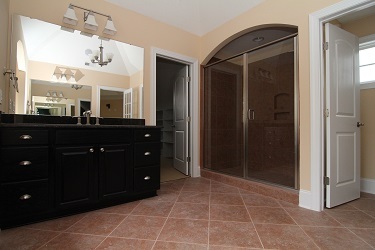 The master suite opens through double doors. 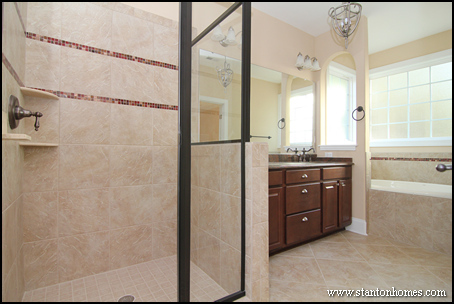 The master bath is private and luxurious with a spa tub. The three-car garage connects to the home at the laundry room / mudroom. 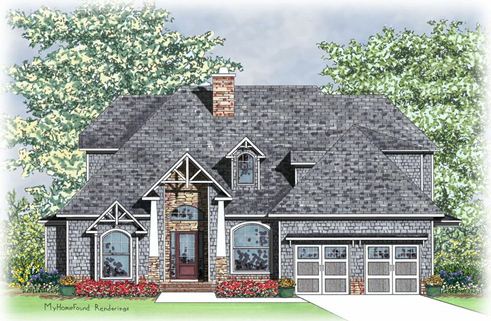 Why this plan is popular: The Cainsville seamlessly blends craftsman touches and traditional design features to create an estate-sized home that borrows elements from Norman, Mediterranean and English architecture. The recessed entrance is framed between a stone chimney stack arched window. The vaulted great room joins with the nook and island kitchen to form an open gathering space. A formal dining room and study with built-ins offer distinct home spaces. If your lifestyle emphasizes outdoor living, this plan will be enticing with the master suite as well as secondary bedrooms lining the rear wall with patio access. Each bedroom has its own bath, too. The large mudroom leads to the three-car garage. 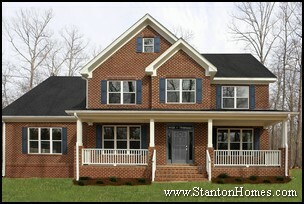 Why this plan is popular: This Frank Betz design offers a classic one story layout with an optional bonus room above. 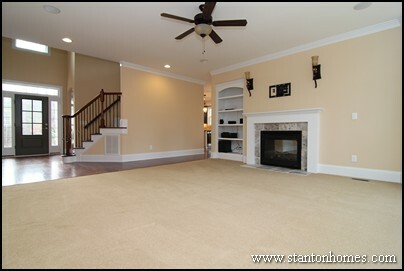 The foyer leads to a formal dining room and vaulted family room. 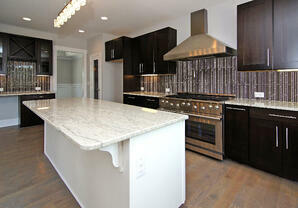 The kitchen features an angled peninsula with bar, open to the breakfast room and family room. 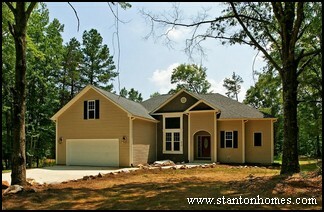 The master suite and secondary bedrooms are located on opposite sides of the home. A screen porch or deck can be added to the rear of the home. Why this plan is popular: From inside and out, the Glen Abbey captures attention. The column, vaulted entry porch leads to the arched front door. Vaulted ceilings open up rooms throughout this Frank Betz home plan. Two fireplaces warm up the inside, one in the keeping room and one in the grand room. Why this plan is popular: In line with classic farmhouse design, this Alan Mascord plan features a wrapping front porch and deck. The great room, private den, island kitchen and dining area are designed for traffic flow. 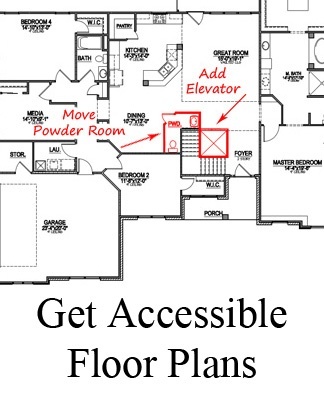 An elevator offers accessibility and convenience. 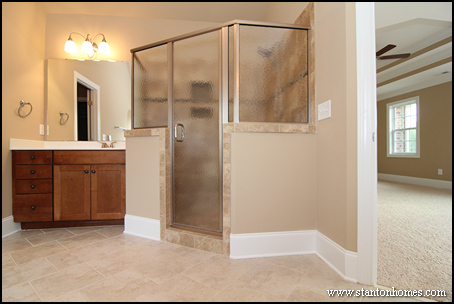 Step into a custom home shower designed for your comfort and pleasure, with a master suite retreat that's pure enjoyment. Take a look at how to make it happen from the point of view of interior design experts - with these photos of top tile shower designs for 2014. Multiple angles of each master shower provide full bathroom views, as well as interior shots of shower tile. 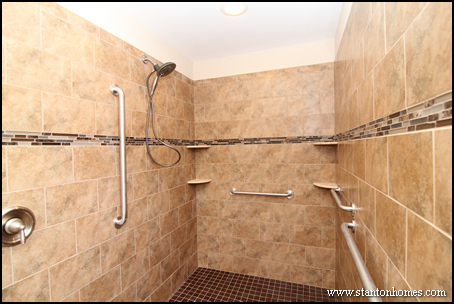 An enlarged master shower feels luxurious and spacious enough for two. 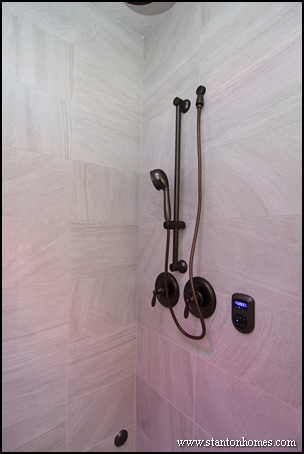 The master shower pictured here - taken from a version of the Maple Lane - incorporates a warm color pallete with earth toned tile, gravel colored accents, and brushed nickel fixtures. Extra long 12'' by 24'' tiles are divided by a listello accent. 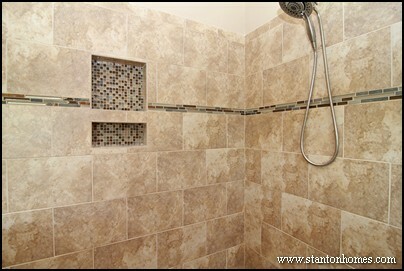 The built-in shower storage is backed in a mini mosaic tile design. 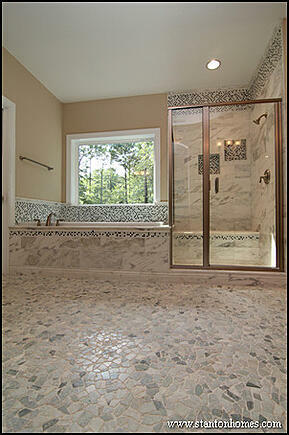 1'' by 1'' tiles make up the shower floor. 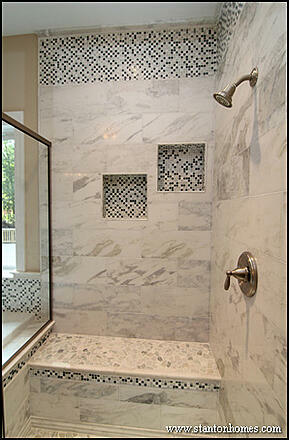 Click here for more photos of mini mosaic tile shower designs. 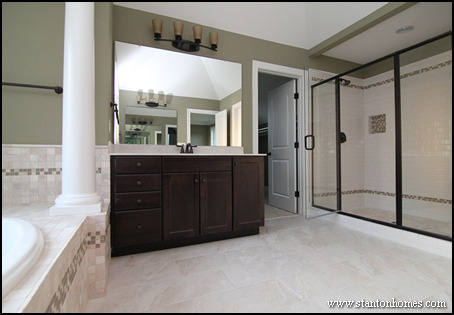 Some of the best tile shower designs for 2014 are framed with full glass enclosures - which open up the room and eliminate distracting brushed nickel lines. 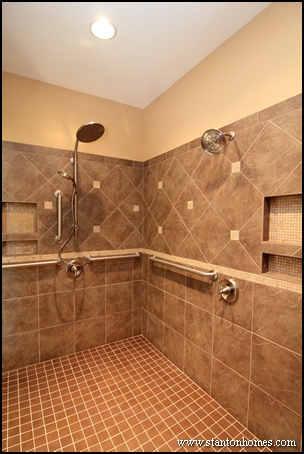 - A brushed nickel grab bar, a top feature in homes designed with Aging in Place in mind. 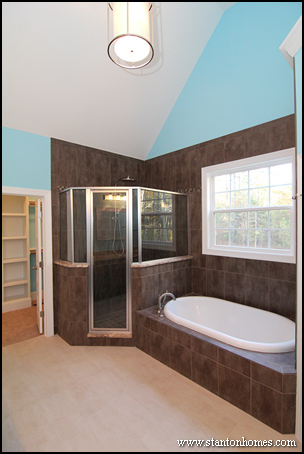 - Listello accents at two heights, with the lower listello accent carrying the tile tub design through the shower. - A restful built-in tile bench can be used for sitting, storage, Aging in Place needs, or as a drop off zone. A custom tile shower and tub combination, such as the one pictured here, can make a big difference in your master bath. White tile, especially classic subway tile, will remain popular in 2014 new homes. 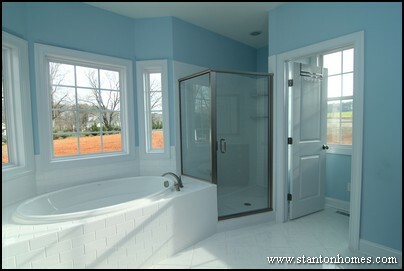 This "All American" farm house style master bathroom features a framed shower with a brushed nickel finish. 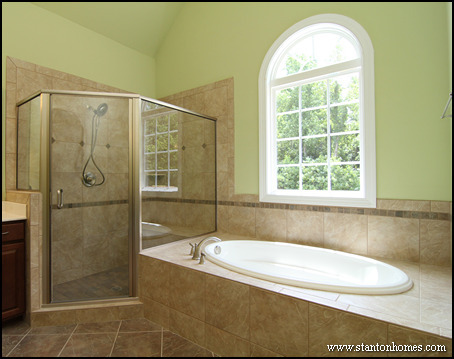 The shower door is made of finished glass, so it is frameless when opened. 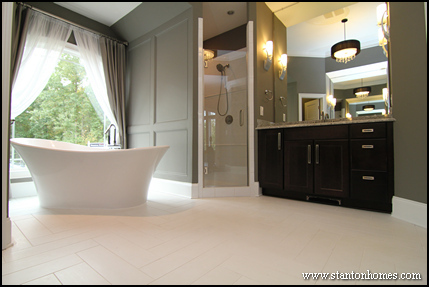 A white subway tile design is carried throughout the master bath, from tub surround to shower, with clean lines and classic appeal. One of the best tile shower designs for 2014, the timeless contrast of white subway tile and white Carrara marble accents in the shower and on the floor coordinates dramatically with dark stained raised panel cabinets. 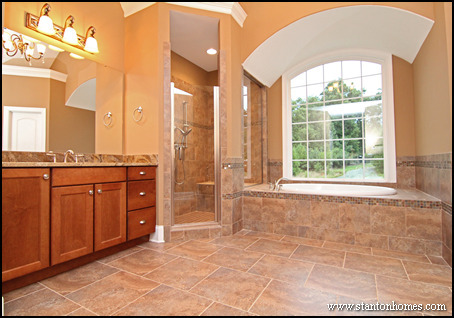 See more photos of this master bathroom, see artist renderings, and get inside information on floor plan design choices. 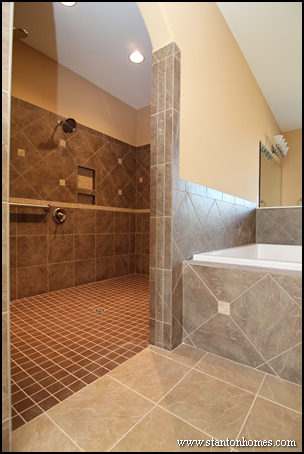 Some of the best tile shower designs for 2014 will maximize the efficiency of your space, with tucked-in layouts. This oversized shower leverages a tucked away location to maximize spaciousness, while maintaining the integrity of a romantic decor. 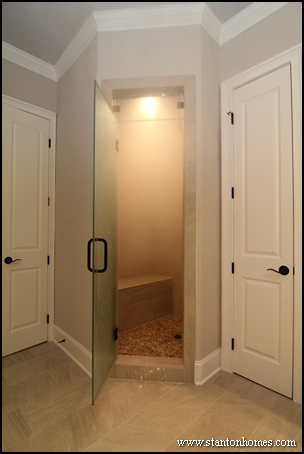 You will also see more creative entrances such as arched openings in the best tile shower designs for 2014 new homes. 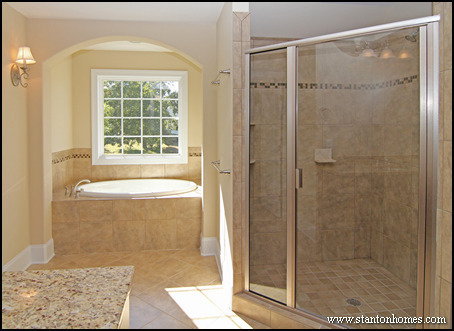 In this master bathroom, a version of the Summerlyn by Frank Betz, the rectangular shower is tucked into an alcove, saving floor space without sacrificing square footage. Here are photos and descriptions of our top 5 most popular 2014 fireplace design trends. Find inspiration for your new home - see which fireplace design suites your personality (and your family's needs) best, below. New home buyers are making outdoor living spaces even more functional - by adding a fireplace. With an exterior fireplace, homeowners can enjoy a warm and inviting fire during gatherings or quiet evenings. This see-through fireplace connects the rear courtyard patio to the living room - taken from a version of the Country Manor. 2014 new homes will see more see-through fireplace designs, inside and out. This see-through fireplace connects the sunroom to the two-story family room - taken from a version of the Summerlyn. 2014 new homes will also take fireplace to the next level, literally. This impressive two story stone fireplace - visible from every angle, including the two-story overlook - was included in a version of Le Chalet Vert. 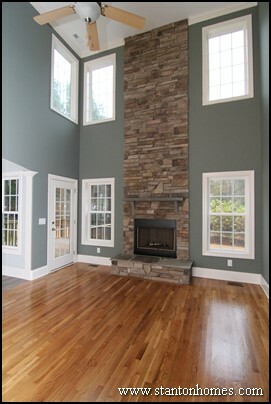 Contact us to talk about your floor plan design - and we'll tell you how to incorporate a two-story fireplace. Fireplaces designed to accommodate an entertainment center will continue to be popular in 2014 new homes. 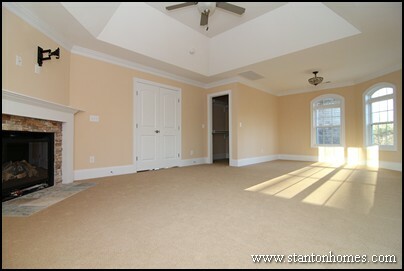 In this family room, dual sconces and a built in bookcase add elegance and functionality. More master suites will include fireplaces in 2014. Who can resist such a cozy atmosphere? Let us know the elements that appeal to you. Tell us more about your priorities and the lot and community where you want to build. 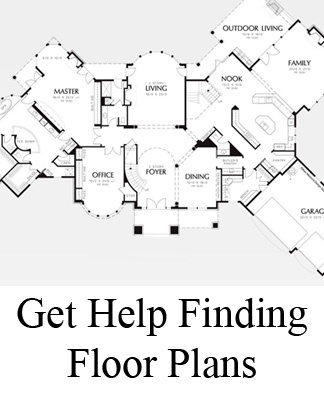 And we’ll suggest floor plans to consider as a starting point. 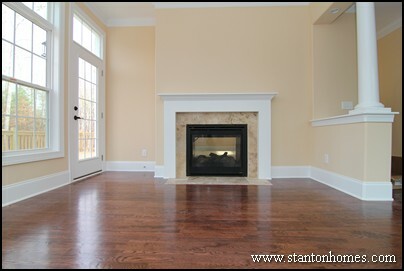 Click here to contact Stanton Homes or call us at 919-278-8070.